“The world forgetting, by the world forgot / Eternal sunshine of the spotless mind!” These beautiful lines were taken from Alexander Pope’s Eloisa to Abelard and the new flick Eternal Sunshine of the Spotless Mind, starring Jim Carrey. They were quoted by Mary (Kirsten Dunst) who is an employee of Lacuna Inc, a company in the business of erasing painful memories to make people happier. 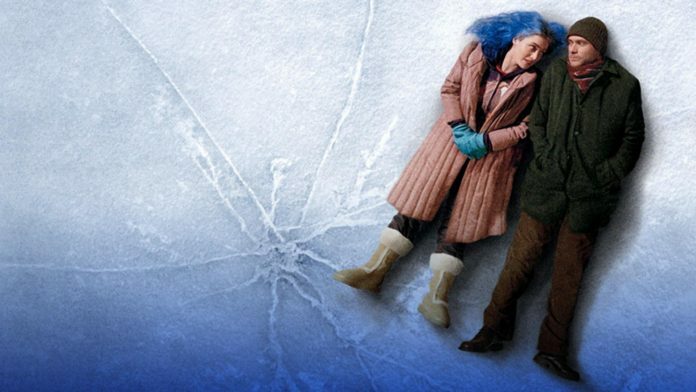 The tale focuses around Joel (Carrey) and his relationship with the blue-haired mystery girl, Clementine (Kate Winslet). Jim Carrey does an amazing job portraying the shy, self-conscious Joel. I couldn’t help but notice Carrey’s progressing age. It is hard to believe that the child-like comedian is in his forties. Nevertheless, the wrinkles help to depict Joel as an average guy. I must say that the casting director did a great job, all the actors involved in the movie performed very well. Winslet makes an unbelievable character come to life in her part as Joel’s girlfriend Clementine. The character is overly impulsive and not developed thoroughly but Winslet’s acting does a good job in covering up the flaws. After the couple breaks up, the impulsive Clementine decides to have Joel erased from her memory through the services of Lacuna Inc. As some ineffective form of retaliation, Joel decides to have Clementine erased as well. The theme of the movie is shown through Joel’s memories of his relationship with Clementine. In order to have the memories erased, he relives the memories in dreams while they are performing the operation. As he is dreaming, he realizes that although his relationship ended badly, he is happy in many of his memories. It is a happiness that he doesn’t want to forget. Although unsavory things happen, such as terrible break-ups, one must have relationships and/or experiences in general to know happiness. During the operation, Joel decides that he doesn’t want to have his memories erased but is unable wake up to stop the procedure. It is a love story but one uniquely entertaining. With small glimpses into the lives of the minor characters such as Frank and Patrick, the technicians who perform the erasing operation, a sort of liveliness is added to the plot. Although not important to the theme of the story, seeing kids smoking pot and dancing around in their underwear kept me entertained. The movie has thoughtful dialogue, delivered most often by Joel, and it is a trait that seems to fit with his quiet but insightful personality. Mary’s reciting of quotes also brings interesting information into the plot. However, while the acting in the film was spectacular, I am only rating the film a six out of ten. Sometimes, I leave a movie theatre with the feeling that I will not forget the movie, but after seeing Eternal Sunshine of the Spotless Mind I just left the theatre. If you are looking for a good light-hearted inoffensive movie for a date, this could be it. You might be wasting your time if you wait in long lines at the movie theatre expecting something as impressive as the title suggests, but I would definitely say it is worth to rent on DVD.